This was my first cake, I read this site and went shopping - only took about 2.5 hours to figure out the cake! 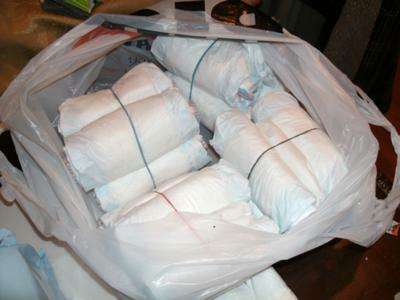 I started with Bundles.jpg of 4 diapers (size 3) rolled from the opening to the crotch. I did not put a rubber band on every diaper because that would cause a mess when mother cuts into the cake! 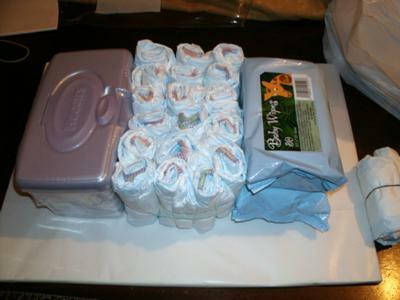 I wanted to include more than just diapers, so my Base1.jpg shows how I used a box of wipes and 2 packs of refills. I used double sided tape to keep the wipes together and on the cardboard covered in tissue paper. The diapers have a large rubber band around them to group them. I then remembered that I also had a blanket to give so I created Base2.jpg for a hidden surprise. I got my BaseReady.jpg by adding a couple of pencils (not sharpened). I then used tissue paper for the BaseWraped.jpg that was not very flat. The weight of the Middle.jpg layer flattened the blanket pretty good. 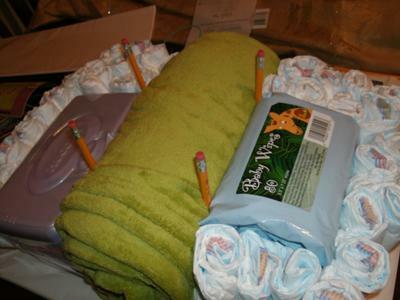 I wanted to show the size 2 diapers a little when I got the MiddleWrapped.jpg and added pencils again. 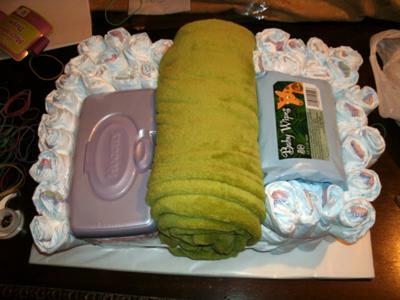 The Top.jpg is the remaining size 2 diapers in a circle with tissue paper and ribbon. Next time I will use wider ribbon on the base to help square it off.